A few days ago, Britain’s leader Theresa May said chemical weapons had been used “all too often” recently, insisting that “the international community [the West]… will not accept this”. May was of course referring to Bashar al-Assad‘s Syrian government, but neglected to mention that Britain itself has a century-old association with chemical warfare. The British widely utilized gas during the First World War (from September 1915), on later occasions against Bolshevik troops, and in “experiments” on Indian soldiers in the 1930s and 1940s. Winston Churchill, perhaps Britain’s most famous ever prime minister and former leader of May’s own Conservative Party, was himself a strong proponent of “using poisoned gas against uncivilized tribes”. May also failed to highlight how the senior partner in her nation’s special relationship, the United States, have been using chemical weapons themselves “all too often” of late. In June last year, Amnesty International singled out US-led coalition forces fighting in northern Syria for its “use of white phosphorus munitions” near Raqqa, a densely populated area. Amnesty confirmed the deployment of American-led chemical warfare “after verifying five videos of the incident”. When making contact with human skin white phosphorus penetrates flesh, burning to the bone. However, this incident went largely unreported in mainstream circles, disappearing quickly. Further, US-backed forces last year used white phosphorus in the battle for Mosul – as confirmed by New Zealand’s Brigadier General, Hugh McAslan, operating in the area, and elsewhere by US Army Colonel Ryan Dillon. Back home in Britain, on these instances, May was not heard outlining her horrified objections to chemical warfare usage by Western-led powers. Pious concerns are only relayed when an official enemy, like Assad, can be accused of an alleged chemical attack. 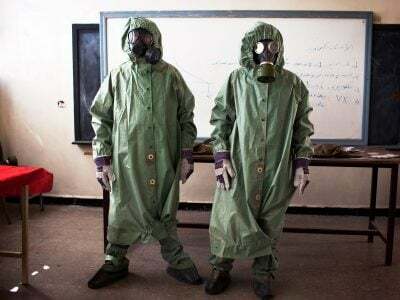 On such occasions, May insists “we cannot allow the use of chemical weapons to be normalized”. A year ago, US president Donald Trump mourned the loss of “innocent children” which had “a big impact on me” – after a previous alleged chemical attack by Syrian government forces in Khan Sheikhoun, northwest Syria. During the same period, US-led forces were responsible for killing up to 11,000 civilians in the battle against ISIS in Mosul, northern Iraq. The death toll was “10 times greater” than initially reported by mainstream outlets, while Mosul itself was reduced to rubble. This time, Trump expressed no sadness at the deaths of “innocent children” his forces were culpable for, nor did it appear to have “a big impact” on him either. Rather, in a July 2017 statement he celebrated “the liberation of Mosul”, while pinning the civilian death toll exclusively “at the hands of ISIS”. The hypocrisy on show reaches unprecedented levels among the leaders of “civilized” first world nations. For decades, Western politicians have had little compunction in waging war for political and geostrategic purposes – on the outlandish pretexts of thwarting “Soviet aggression” or, later, “democracy promotion” – while ignoring the devastating consequences of their actions. In lambasting Assad, who may be no God-given saint, politicians further display a high level of historical blindness. During the early 1950s, the US Air Force released 32,000 tons of the chemical liquid napalm upon Korea – while in the 1960s and 70s, American planes dropped over 20 million gallons of poisonous chemicals (napalm, dioxin, etc.) on Vietnam, Cambodia and Laos. The Soviet Union had no such record as this. In the Iran-Iraq War (1980-1988), while supporting Saddam Hussein, America and Britain were aware as early as 1983 the dictator was using poisoned gas against Iran, including sarin, a lethal nerve agent. Undeterred, Hussein was given ample backing for years with intelligence reports and other aid, including “agricultural” support, despite the West having “firm evidence of Iraqi chemical attacks”. As the retired US Air Force intelligence officer Rick Francona confirmed later, America “already knew” about Iraq’s chemical attacks. These policies culminated in Hussein carrying out the 1988 Halabja chemical attack, which killed about 5,000 people, the worst gas attack since the demise of the Third Reich. None of this has been recalled by either May, Trump, Mike Pence, Boris Johnson or other public figures too many to mention. “Capitalism has no moral and ethical values. Everything is for sale. It is impossible to educate people in such an environment”. Trump himself had immediately labeled Castro “a brutal dictator” upon his death in November 2016, a comment with quite a few ironic overtones. Castro, after a long struggle, had by 1959 overthrown the vicious US-supported Fulgencio Batista dictatorship. Batista, a long-time US favorite, had in the past flown to Washington to meet presidents Franklin D. Roosevelt and Dwight D. Eisenhower, while also seeing Richard Nixon in 1954, when he was vice president. Batista is just one name in a long list of murderous dictators warmly greeted in America, and to have graced the White House’s hallowed halls – there was also the Shah, Suharto, Park Chung-hee, Pinochet, Videla, Stroessner, Ceausescu, Mubarak, etc. These individuals’ crimes vastly outweigh anything that even Assad’s strongest critics can level at him, and they all experienced firm Western backing. General Suharto, the worst of all, enjoyed especially significant American and British support from the beginning, despite killing up to a million Indonesians during his first months of control (1965-1966). The CIA, no less, described the forgotten genocide as “one of the worst mass murders of the 20th century”. Long after this holocaust was perpetrated, General Suharto remained “a moderating force” according to Western publications, or even “at heart benign” (so insisted the London-based Economist magazine). One can surmise because Suharto kindly allowed Western corporations to exploit Indonesia’s massive resources. Elsewhere Batista himself, during his time in power in the 1950s, oversaw a Cuba that was a true gangster’s paradise, killing tens of thousands of his own people amid widespread repressions. None of this mattered while Batista obeyed orders from Washington, allowing US business interests to dominate the economy. In the Batista years, the Cuban national literacy rate (those able to read and write) was as low as 60%. By December 1961, with Castro less than three years in power, Cuba’s literacy levels rose to a remarkable 96%, one of the highest in the world. This was as a result of nationwide efforts by Castro and Che Guevara to educate the Cuban population, young and old. Indeed, it was “the world’s most ambitious and organized literacy campaign”. Such policies as this did not appeal to American tastes, however. 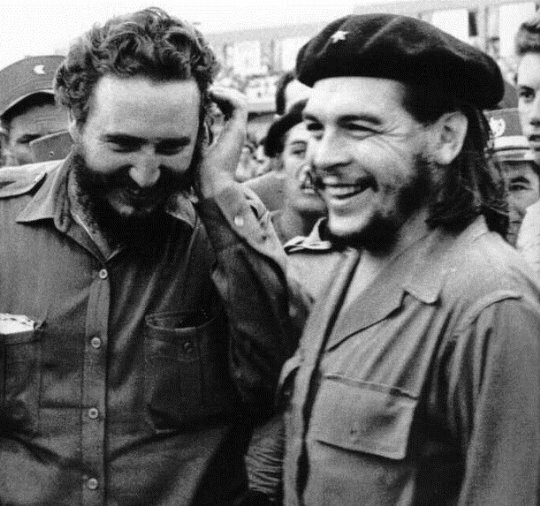 Nor was it palatable to American elites as they looked on aghast while Castro performed the leading role in liberating southern Africa from apartheid – Cuban-led forces time and again defeating the US-backed terrorists propping up South Africa’s racist regime. It would appear Castro is “a brutal dictator” for undertaking actions like these. No such description is allocated to Saudi Arabia’s King Salman, who Trump called “a special man” during meetings last month with his son, Mohammad Bin Salman. Amnesty International have repeatedly criticized the King for overseeing “an unprecedented wave of executions” in the oil rich kingdom, among other violations, while he also started the famine war against Yemen. The deadly conflict, made possible by Western support, has also been carried forward with zeal by the new “Crown Prince” Bin Salman, who has been implicated in the Yemeni bombings. The UN says that Bin Salman “should face international sanctions” for “violating the laws of war” – while last month Amnesty noted that since his appointment as “Crown Prince” in June 2017, “the crackdown against dissenting voices in his country has only intensified”. Little of this is being reported in the mainstream, however. It goes against the grain to criticize the oil dictator countries Western governments support. Instead, audiences are informed of Bin Salman’s valiant policies of allowing women to drive cars and his opening of cinemas. His friendly meetings with multinational bosses like Tim Cook (Apple) and Mark Zuckerberg (Facebook) serve as another useful propaganda boost.